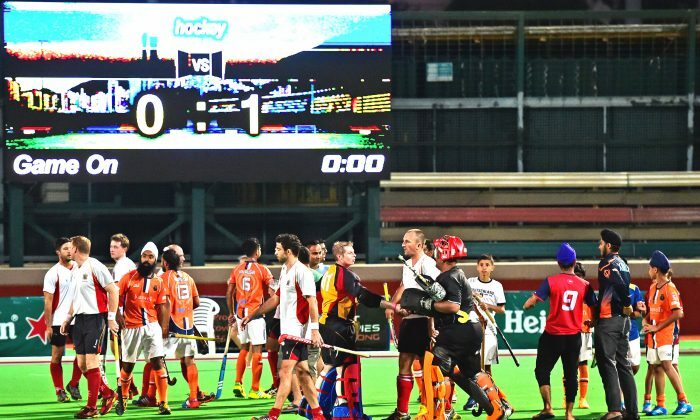 Hong Kong—Khalsa won the Hong Kong Hockey Sixes organized and run by the Hong Kong Football Club and held at Sports Road during the Saturday and Sunday of the 2015 Easter Weekend. Khalsa also provided players for the Peninsula team that won the HKFC Hockey All Stars 6s 3-match series against the Island team and swept the board in the Youth Tournament to become the HKFC Hockey 6s Youth Cup Champions 2015. Six local teams (SSSC, Khalsa, HKCC, Punjab, HKFC and KCC) plus Yokoe of Japan took part in the top level Men’s Super 6s competition, all initially playing each other in a single Group round robin competition. The top four teams then moved into Semi-final knockouts to compete for the HK$10,000 prize. After the round robin matches SSSC were top with 15-points Khalsa were second with 14-points and Yokoe Japan were 3rd with 13-points. But the surprise of the tournament was the performance of the HKCC team who beat Punjab 4-2 in their round robin match to just edge Punjab on goal difference for 4th place. HKCC went on to higher success but knocking out SSSC in the semi-final to take a place in the final. Khalsa beat Yokoe Japan in the other semi-final. One might have thought that Khalsa would have an easy task against HKCC in the final but this was not the case, HKCC performed brilliantly to make this a memorable match well worth of the accolade. HKCC showed great stickwork, good strategy and were firmly resolute in both attack and defence – in fact to the onlooker one might say they deserved to win. After a long period of no score Khalsa finally broke the deadlock to take the title….and the money. Near to the end of the final, HKCC slotted the ball in the net and thought they had equalized but the umpire spotted an infringement and it was disallowed. The remainder of the competition involving 15 teams playing more social, mixed hockey 6s, was also great fun. Teams from Switzerland (The Flying Hoppers), Indonesia (ISCI), Dubai (Average Joes) and Doha (Doha Hockey Club) took part. These teams were split into two groups for round robin matches with the top teams competing for Cup and Plate awards with the lower teams playing off for the Bowl. Winners of the Cup were the Flying Hoppers from Switzerland while the Plate was won by HKU Swire and the Bowl winners were Generations. Representative matches between Island and Peninsula teams were also great fun with high standard of hockey on both sides. The Peninsula team took the 3-match series by 2-games to 1 to become the HKFC Hockey All Stars 6s Champions.